YSI products, which are available from Geotech Environmental Equipment, are ideal water monitoring solutions. Whether you are concerned with climate change, floods, droughts, stormwater runoff, clean drinking water, or healthy ecosystems, YSI products are reliable data collecting instruments. YSI instruments, software and data collection platforms are focused on environmental monitoring and testing. The integrated systems will obtain critical data about the quality of water. Pro Series instruments are designed to be extremely versatile, tough and smart in the field. They accommodate a wide assortment of cables, sensors and accessories. Want to measure DO in the field? Want that DO to be polarographic, galvanic, or optical technology? Maybe you're interested in pH, DO and nitrate together? Or perhaps you need an instrument you can use in the field and also measure BODs in the laboratory? Whatever you need... the Professional Series line has the solution. The Pro Series family consists of the Professional Plus, ProODO, Pro1020, Pro1030, Pro2030, Pro20 and Pro30. For easy decision-making, please refer to the matrix on page 3 of the spec sheet. 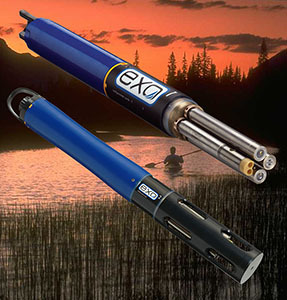 EXO was designed to be extremely versatile, allowing the user to configure a sonde for different applications in minutes. The key to this versatility is the smart sensors and smart ports. Each smart port is identical and automatically recognizes any EXO sensor so that sensor payloads can be configured by the user. Geotech Environmental Equipment can take care of all your YSI EXO Series needs in Colorado, New Mexico, Utah and Wyoming. 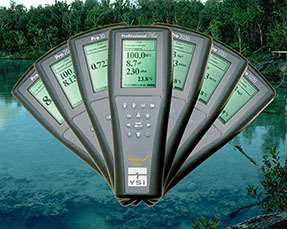 The original line of YSI Field Meters are proven and reliable water quality instruments. Geotech provides quality service for your YSI equipment with factory certified technicians for maintenance, calibration and repair. Geotech also provides rentals of this fine instrument line. Geotech is a YSI Environmental warranty center for YSI field instruments. If you would like more information about the YSI Professional Plus or other YSI products, contact your Geotech trained professional. Ok, it is a bit early to talk spring, but not for sampling and monitoring ground and surface water. What we are referring to is your equipment. The electronic gizmos sitting on your shelf collecting dust over the winter months. This is when we get most of the panicked calls about equipment not calibrating, turning on, or generally just being temperamental. So, now is the time to think about this equipment, not next month, not the month after, now! Here is a list of pointers to help you find out if you have any issues now, so you can have them resolved prior to loading the truck or flying out. Checking things out now will keep you from losing time and money in panicked overnight shipments for parts, calibrations, repairs, and possibly rental equipment to get you going when your stuff fails. Does it turn on? Does it need new batteries? Alkaline batteries left in equipment can off-gas over time, causing corrosion. Check them now. If rechargeable, time to give it a good charge and test it out. Better to know now if that battery can hold a charge or if the charger is defunct. Yep, O-Rings! Any meter with submersible field changeable sensors are bound to have O-Rings to keep the water out of the connections. Take out the sensors, replace or re-silicone the O-rings (remember a little bit of silicone, just enough to make the O-ring sticky, not slippery). A word of warning; do not get silicone into the pins or actual contacts. You will do more harm than good!! Water quality sensors such as pH and Dissolved Oxygen should be stored wet. Never store in DI water! Never. Water is the “universal solvent”; DI water will kill sensors dead if they are left in it for a period of time. Clean with it, do not store with it! pH storage solutions are available. 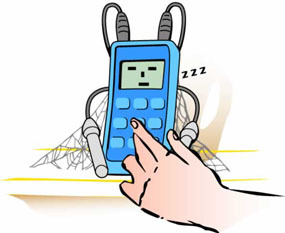 In general, storing in pH 4 buffer is a safe bet, please check your manual! Dissolved Oxygen (DO) sensors can typically be stored with a sponge or with just a small layer of water in the storage chamber that does not directly contact the sensor. A small piece of sponge holds water longer. Sure, you will have to calibrate again before you use it, but find out now if any sensors are out of whack, and if there are any that need repair or replacement, now is the time. Ground shipping is still far cheaper than Next Day Air. a. Cables and connections. Any bent pins? Corrosion? b. Communication cables. Still got them if you need them? Test them out. c. Software. Any IT updates in your office knock your software out? Test. d. Firmware updates. These fix bugs with equipment so they can function better. This is just a basic list, and air quality instruments not used for a season will need the same love and attention as water quality instruments. If you use sampling pumps, time to break them out and give them a test, too. Remember, this equipment gets you your data, which is what you are out there for…right!? let’s figure out what happened together! 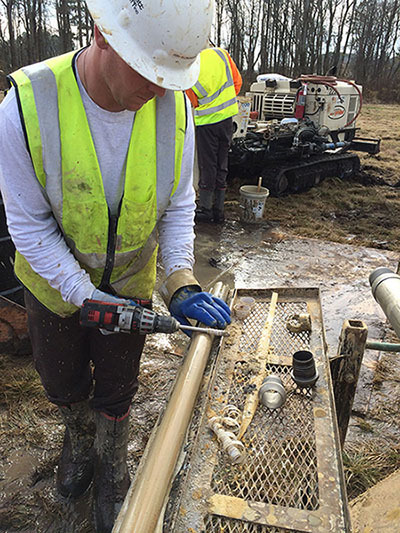 Butch Stevens, Project Manager with Parratt-Wolff, Inc., took this picture of Joshua Ellingworth, a driller for Parratt-Wolff, opening a Zipliner Soil Sampling Sleeve with a ZipTool at a former fertilizer plant in eastern NC. 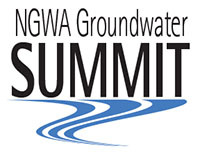 Everything groundwater will be at the 2014 NGWA Groundwater Summit. There will be a tour and happy hour at Geotech Environmental Equipment's manufacturing and engineering facilities, located just ten minutes from downtown Denver. Prices and promotions mentioned in this newsletter are valid through April 30, 2014.